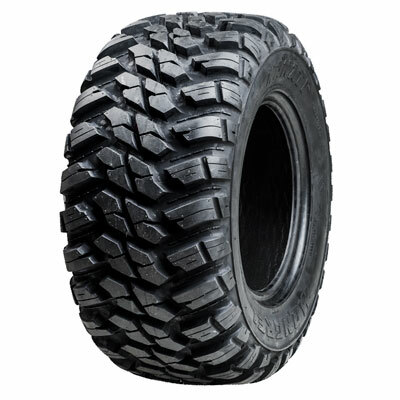 Home > ATV Accessories > GBC Kanati Mongrel Radial ATV Tires, D.O.T. GBC has released a new and improved version of the very popular Kanati Mongrel tires. The all new Mongrel tire features a 10 ply rating and an improved sidewall for better puncture resistance and overall better reliability on the larger Side by Sides. Besides the added plies and stronger sidewall the rest of the tire is basically the same. It has the same tread pattern as the 8 ply and it's still a DOT approved radial tire. Take advantage of these added benefits over the original Mongrel tires and upgrade your tires today with a set of the all new 10 ply mongrels! 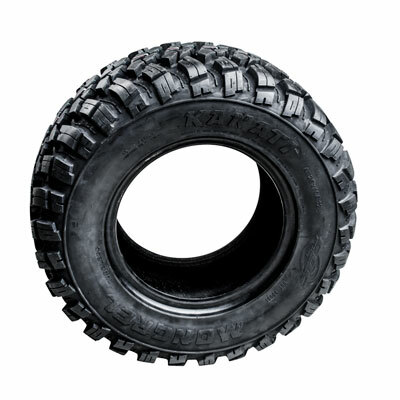 - GBC Kanati Mongrel tires are sold individually. - In most cases our GBC tires ship out within 1 business day! A great all around tire. Quiet on asphalt and good traction off road. I have now ordered 10 sets of tires and a few wheel combos and every time have been very satisfied with the service but also the quality of the tires and wheels. I have started buying the Mongrels and won't buy anything else. They hold up to the abuse that my machines go through and would recommend them to anyone wanting something that is GREAT on the pavement as well as offroad. Thanks for everything guys! I am really happy with these tires so far. The shipping was super fast and I had them on in no time. Time will tell if the DOT rating will hold up to the oil top roads I drive down. But as of now I am happy! I’ve wore out a set of these and never had one flat! I ordered tires here and shipping was super fast no tax and great service! Thank u! Just put these on my Kawa Mule Pro Fxt and so far I love them, made handling much firmer when cornering. GREAT customer service, super fast shipping, and AWESOME product! We couldn't be more pleased with our new side by side tires! Thanks again Pure Offroad for the help! Mongrel tires are awesome, had to exchange for a different size, spencer was a ton of help in doing that,, would recommend this company to anyone, great prices and great customer service. My UTE is much smoother on paved roads now. 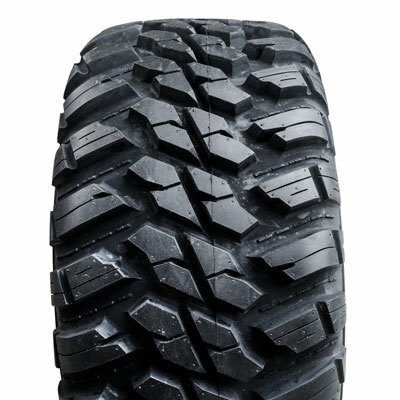 The aggressive tread is more than adequate for mud, sand and snow. I couldn’t be more pleased. Extremely fast shipping!! I wanted a tire that would last longer on hard surfaces, and hopefully these will be up to the task. I haven't had them for very long, but the hard surface rides are very smooth. They also perform much better than I expected in muddy conditions and climbing. Ive only put them on the rear, as my front tires weren't very worn. But after feeling the ride, I will probably put these on the front as well very soon. The company was great to deal with!!! Q: will 30x10x14" mongrels fit the stock rims 29x9x14 front and 29x11x14 back 2014 rzr xp 1000 with no problems? A: Yes they will fit but we don't recommend it. The reason is because your factory rims are two different widths. The fronts are skinnier than the backs, this would cause your tires to be different heights. If you have aftermarket rims they would most likely all be the same width so it wouldn't be an issue to run 30x10 all the way around. Let us know if we can help with getting a kit put together for you. Thanks! A: Yes these do run pretty true to size. The width of rims that you mount them on can affect the overall height of the tire too. The skinnier the rim the taller the tire will be. Q: Thanks for all your help. This tire seems like a good candidate. What is the load index? How many miles are expected out of this tire? Is it a soft compound or does it wear well on hard pack & asphalt? Is it a smoot and quiet ride? A: Every size has a different load rating. What size are you looking for and I'll let you know. ATV/UTV tires don't have any kind of Mileage rating. Most customers are getting around 4k miles at least out of this type of tire. It wears well on hard pack. Q: We have a 2016 Polaris Sportsman. It is the smaller one, 400 I think. We need to outfit it with DOT approved tires. Would these work, and will they fit on the stock wheels? Q: Will the 26-10-12 or 27-11-12 Mongrel fit a stock 2017 Honda Pioneer 700-4 (stock wheels, no lift, no spacers)? A: Yes you could run the 26x10-12 or you might also consider running the 27x9-12. Either would work just fine. The 27-11-12 would work on the rear but not the front. Q: I have a JD gator. Tire size 26-9.00-12 26-11.00-12 I would like to put the 10 ply GBC on it or any 10ply. It is used for construction job sites ? A: Yes these are heavy duty tires that are used frequently for your application. Let us know if you have any other q's. thanks! Q: Do you have size LT 285/70/R17? A: No, they don't make this tire in that size. Q: My 2019 Wolverine has 26x8x12 front and 26x10x12 rear. I don't want it any taller/wider (need to fit my toyhauler). I wish to put Mongrels on but there is not a 26x8x12. Would it be okay to use the 25x8x12. Is there any downside to this? A: Yes you can run 25x8 on there. It's just 1 inch shorter overall. Which means you lose 1/2 inch of ground clearance (1/2 inch on top and bottom of the tire) Just the lost ground clearance is the only negative I can think of. Q: Will the Mongrel 27/11/12 fit on a Polaris ranger midsize eps factory rim that has 25/10/12 factory tires on it? A: The 10 ply 25x8 weigh 24 lbs. the 10 ply 25x10 weigh 27 lbs. Those sizes of Mongrels are not offered in 6 ply. Let us know if you have any other q's. Q: I have a 2014 Ranger 800 fullsize with stock rim and tires I would like to go a couple inches higher on the same rims can u tell me wich 4 tires to order for front and back ? A: Your machine should have 12 inch stock rims unless it's a limited edition model with 14's. You should double check that. Assuming you have 12 inch you would want to order 27-9-12 front and 27-11-12 rear. If you have 14 inch rims you would want to order 27-9-14 front and 27-11-14 rear. Anything bigger would not fit your machine. Q: Can I put 28-10-15s on both front and back 2014 Polaris Ranger 900XP with no modification? A: Unfortunately no, in our experience the 28's will not clear without rubbing on a stock Ranger 900. I would recommend 27 inch the largest you go on your model. Q: on a 2014 Polaris Ranger 900 XP can I put 27-11-14 all the way around without modifications? A: No, 11 inch is too wide for the front tire. It will rub. A: Yes the 27x9-12 and 27x11-12 will fit just fine.